Chickadees always amuse me and cheer me up-they are so expressive and entertaining, especially when there is very little else out there to see on a dreary winter day. This one is in my holly bush. Nice pose and like the habitat feel here,beautiful image! nice work on getting the perfect exposure, good shot CYNTHIA. Cindy, I love the very natural (not set up) appearance of your image. It's refreshing. 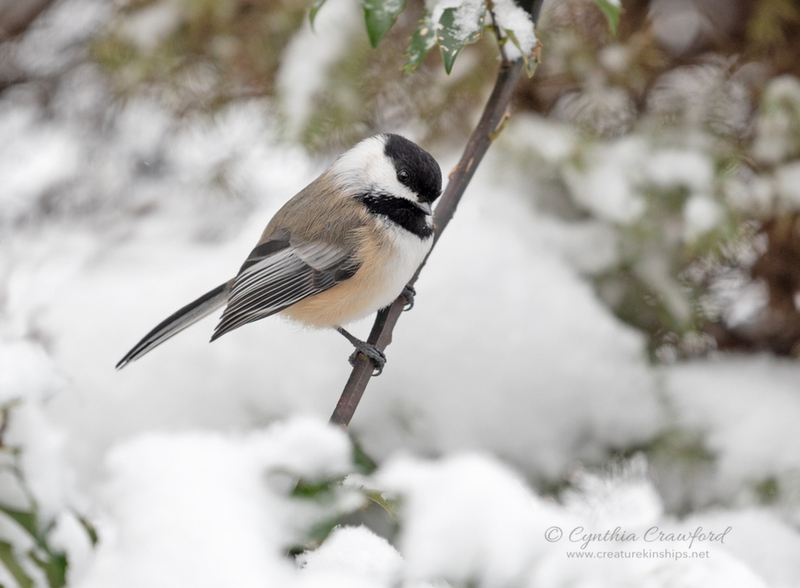 Agree with your thoughts on the expressive character of the Chickadee. You captured impressive detail in this one, and you have created a great winter mood with the snow. Well done! Excellent pose and nice perch. The OOF snow gives it a nice backdrop. A must click! Adorable pose and wonderful detail on this little beauty, while the snowy setting complements him perfectly, Cindy. One of your best, so far! Cynthia, Nice image with nice details. Interesting that you decided on an aperture of f/4, shutter speed of 320 and ISO 200. It worked well here. Thanks Gene. I was experimenting to see how low I could go at ISO 200 with the D750-testing it's low light capability. I don't think I could have done this as well with the D500. Excellent artistic frame in natural setting . Love the pose & snow, very well captured Cindy. Nice habitat shot of the chickadee. Kind of emblematic of this bird's character. No matter the harsh conditions, it finds a way to survive. I love Chickadees, they have beautiful songs and chirps. Nicely frame with a blurred snow in the BG.